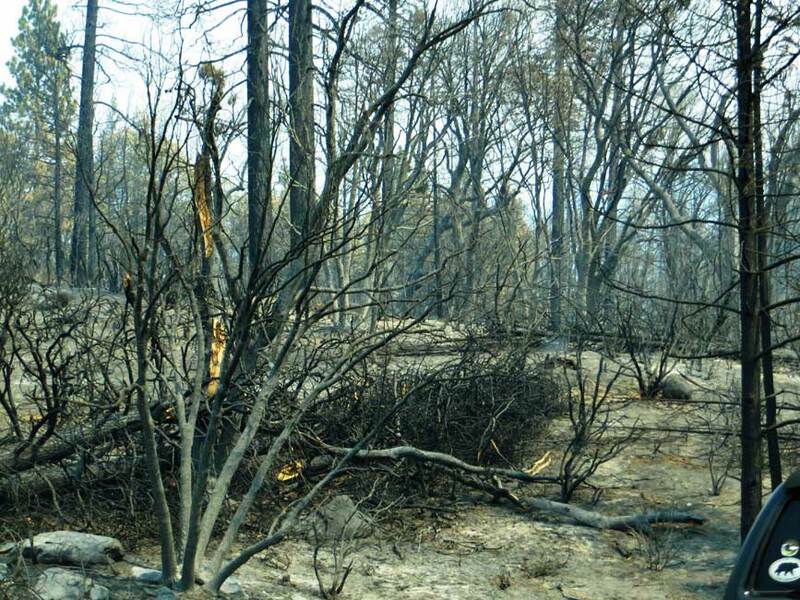 Our Yosemite Rim Fire Visit took place from September 6 – 10, 2013. The Yosemite Rim Fire was in its last stages of being contained. 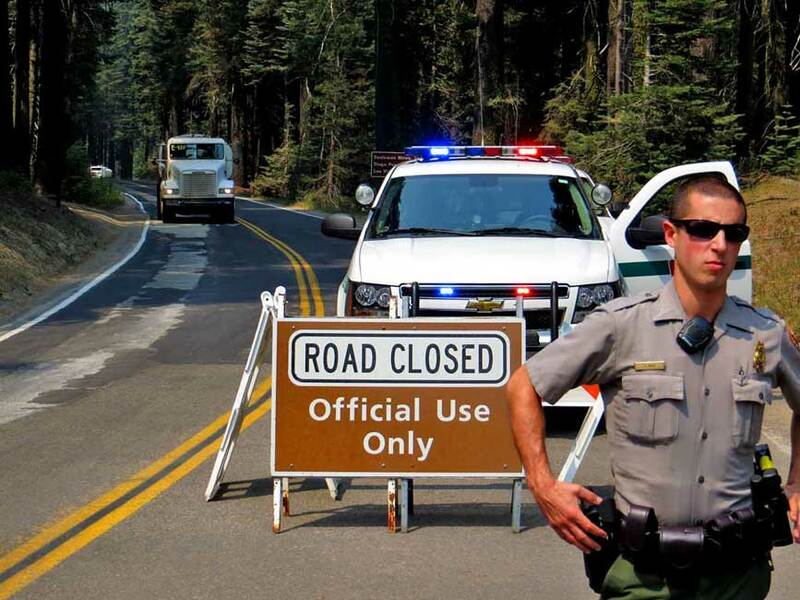 We couldn’t drive through the entire park because of the Rim Fire. The smoke blocked the views too. OurYosemite Rim Fire Visit started by flying in to San Francisco. We stayed at the DoubleTree by Hilton SFO Airport, which is very popular with airline flight crews. 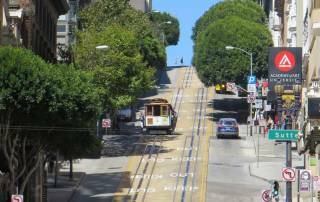 The free airport shuttle and the BART made it easy to travel downtown. 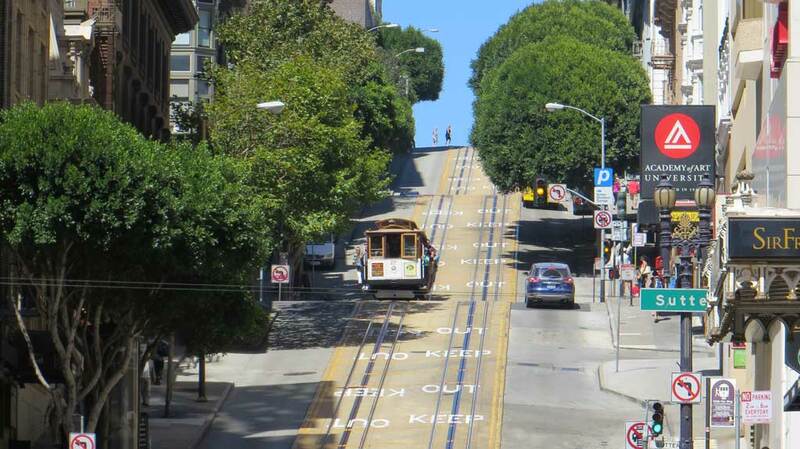 We rode a cable car ride along Powell Street, visited Fisherman’s Wharf and climbed up the Coit Tower. We then rented a car from Enterprise in Burlingame, near our hotel. This was an excellent choice. The rates are much lower than the airport. The pick up and delivery from our hotel was very convenient. Enterprise won me over with their quality and service. The next morning we headed out on our Yosemite Rim Fire Visit. Luckily I checked the internet and wrote down the route out of San Francisco. Destination signs are rare on the California freeways, so this was an essential step. Take 101S, 92E, 880N, 238N, oops, turn around, 238S, 580E, 205E, 5N, 99N and just like that you run into 120E to Yosemite! 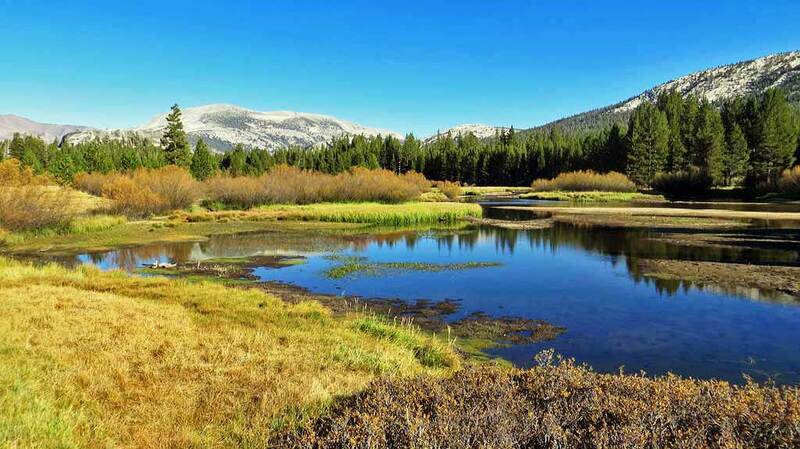 The route through Big Oak flats had opened up two days earlier, but we were headed to Tuolumne Meadows and the Tioga Pass route was closed. 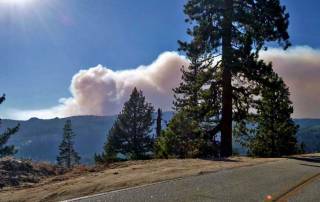 We diverted around the fire to the north on Highway 108 over Sonora Pass. On the way out, the route was smoky. 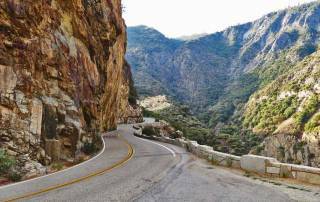 The curves were tight and the road had some 26% grades on the way to 9,600 feet at Sonora Pass. The Stanislaus River was a popular and beautiful trout fly fishing spot on the route. 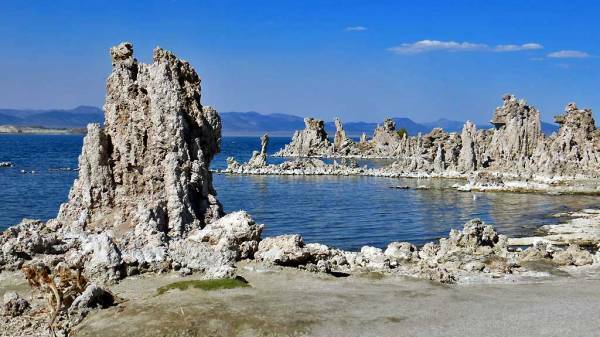 After many hours, we reached Mono Lake on the 7,000 foot plateau east of the Sierra Nevadas. The winds were keeping the Rim Fire smoke away and the lake was a beautiful blue. 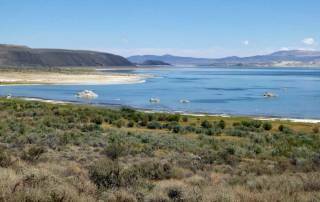 Mono Lake has no natural outlet, so it has a higher concentration of salts than the sea. 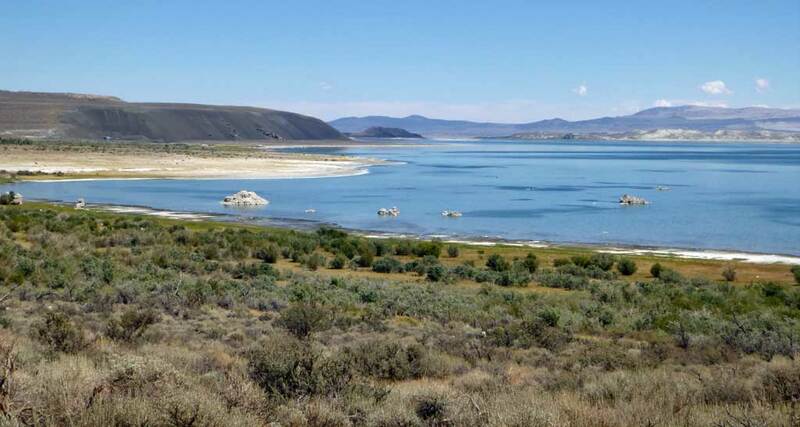 Fish can’t live in Mono Lake, but the microscopic brine shrimp support large bird populations. 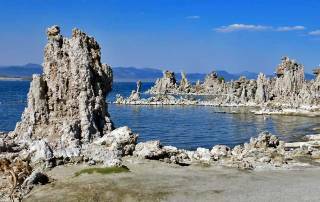 There is a park with tufa formations at the north end of the lake near the town of Lee Vining and a visitor center nearby. The South Tufa formation is much larger and is reached after a 20 minute drive from Lee Vining. 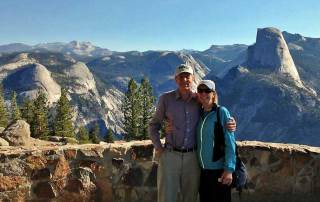 After our Mona Lake tufa tour, our Yosemite visit led us up the Tioga Pass toward Yosemite. Tioga Pass is over 9,900 feet and the cliff edges were illuminated by the afternoon sun. At the top we entered Yosemite National Park. The afternoon was free of Rim Fire smoke free. 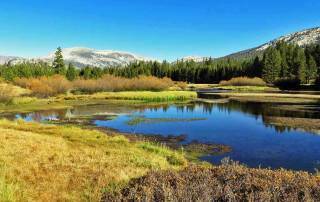 The views at Tuolumne Meadows and Tenaya Lake were gorgeous. Just south of Tenaya Lake there was an excellent view point toward Half Dome in the distance. 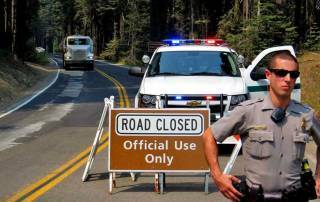 As this point the Rim Fire road closure completely isolated us from Yosemite Village. We had the unique experience of enjoying Yosemite almost by ourselves. 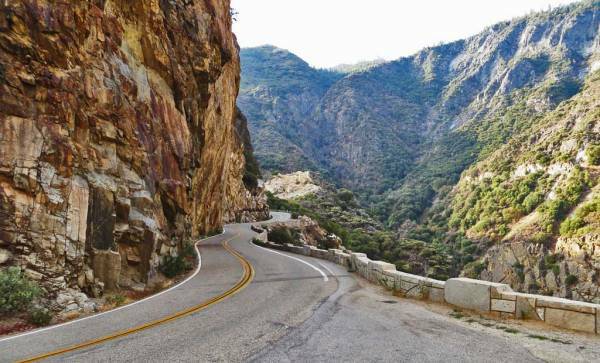 You didn’t even need to pull off the road to stop and see the sights. There was no traffic in either direction. After Tuolumne Meadows, our Yosemite Rim Fire visit followed Highway 120 west to see how far we could go before we reached the Rim Fire road closure. 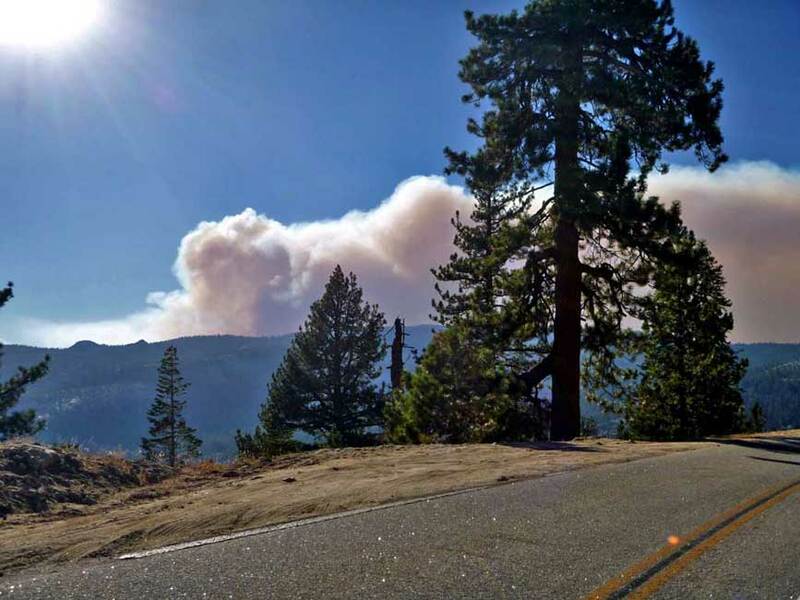 As we drove, we started to see the billowing smoke from the Rim Fire. It was an eerie orange color against the bright blue sky. After a few miles, we reached the Rim Fire road closure at Yosemite Creek. I chatted with the forest ranger at the gate across the highway. She indicated in would likely be more than a week before the road through the park was open again. So, we retraced our path to Lee Vining, stopping along the way for at the rustic Tioga Pass Resort for a home style supper. We spent the night in Lee Vining. In the morning we enjoyed lattes and breakfast sandwiches at the El Mono Hotel. Then we headed back over the Sonora Pass again. The wind had changed and Lee Vining was smoky, but Sonora Pass was crystal clear. 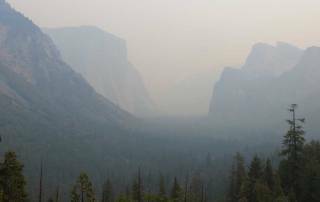 As we approached Yosemite Valley, the smoke was heavy and the views were obscured. Near the park border we drove along the recently opened section of Highway 120. 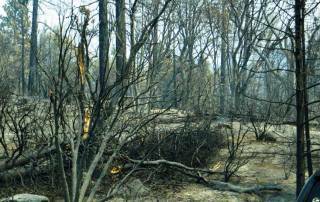 We weren’t allowed to stop, as the woods were burned to the edge of the highway. Fallen timber was still smoldering in a few spots. 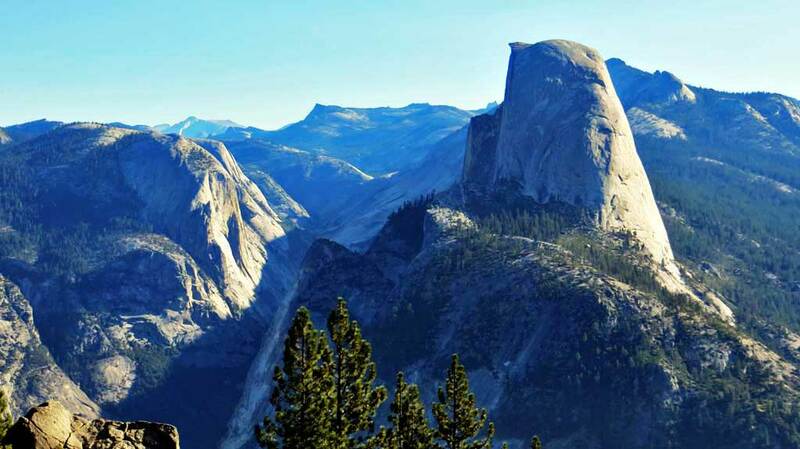 At the famous Tunnel View approach to the Yosemite Valley, all we saw was the faint outline of El Capitan. 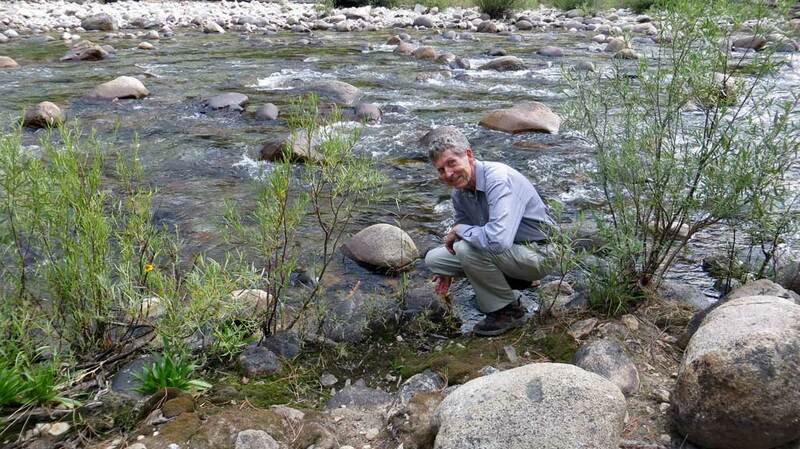 The most surprising thing about this Yosemite Rim Fire Visit in September is the dry rivers. Lower Yosemite Falls – dry; Upper Falls – dry; Bridalveil Falls – dry; Mirror Lake – dry and empty; Merced River – barely flowing. Clearly spring is the time to arrive if you don’t want to see dry rivers. The Rim Fire smoke added an interesting orange glow to the tree trunks. Our accommodation at the Yosemite Valley Lodge was not impressive. The cabins are more like dilapidated barracks. When you open the main doors, an unpleasant stale odor meets you. The stairwells are worn through to the frames. The carpet was very old and dirty looking. I can’t say I’d recommend the lodge, even though it’s location in the park is a major benefit. I’d suggest looking for accommodation outside the park a half hour away in El Portal. We did enjoy the Food Court though. 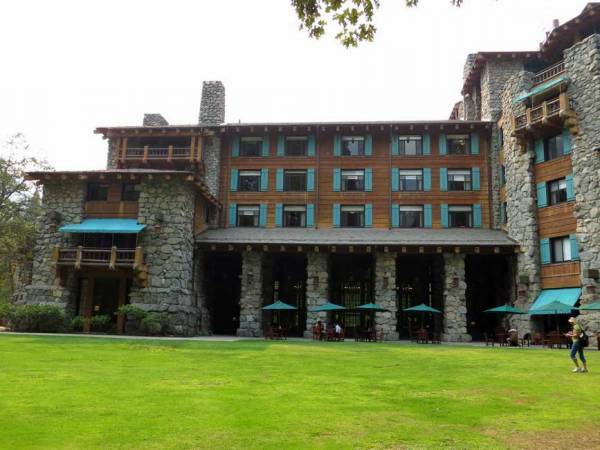 We also checked out the Ahwahnee Hotel (renamed the Majestic Yosemite Hotel). This hotel is extremely high priced, but really worth the extra investment. The Ahwahnee Hotel has a heritage feel to it similar to the great lodges built along the early railroad routes. The next morning there was very little smoke in the valley. We walked through the Yosemite Valley floor along the swinging bridge, which doesn’t swing. We also spent time at the base of El Capitan. 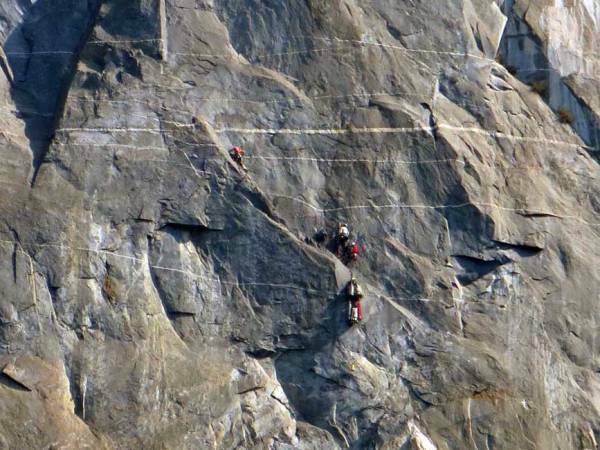 It was amazing how many climbers you can find once you concentrate your vision along the cracks and crevices. 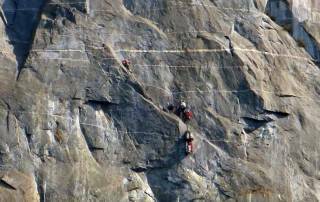 We soon became familiar with the King Swing, as we watched a climber swing back and forth until his arc carried him a sufficient distance to catch the next route up El Capitan. At noon we drove up the 3,000 foot ascent to Glacier Point, but we were disappointed to find the Rim Fire smoke had covered over the valley view. 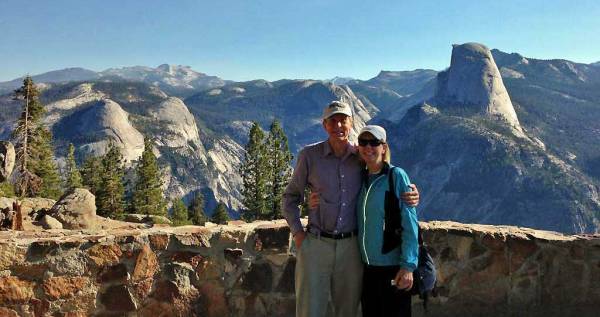 With sunglasses on, you could barely distinguish the outline of Half Dome. In the late afternoon we headed south to the Mariposa Grove. 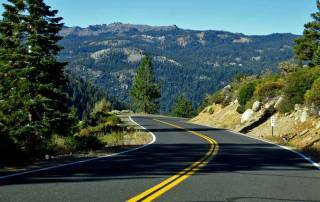 A pattern was beginning to emerge with the California roads along the Sierra Nevada. 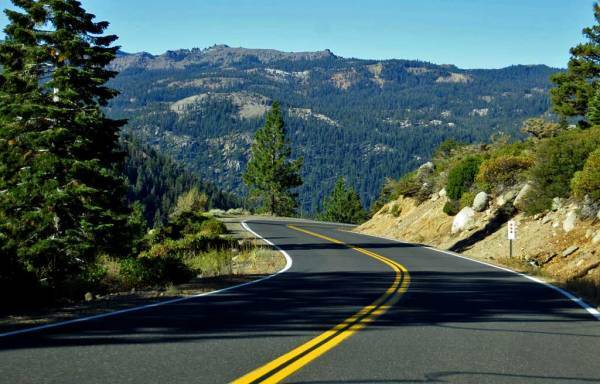 Long grades with turns of 20 – 35 mph and changes in elevation of 2,000 – 4,000 feet make for slow travel times. We stopped at Wawona Lodge on the way. Again this wouldn’t be on my recommended list. The lodge is very old and stuffy with many units having shared bathrooms. 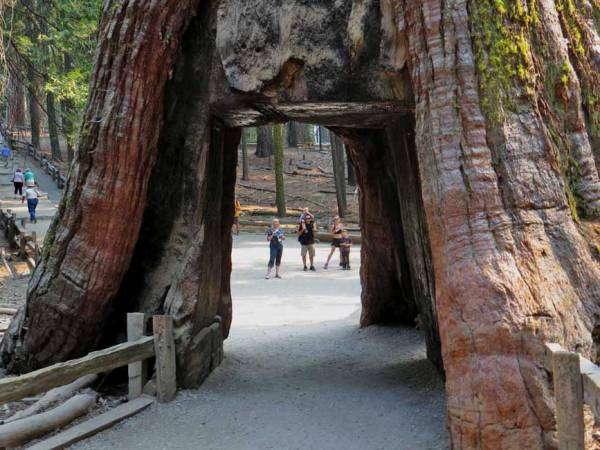 The Mariposa Grove was a pleasing stand of sequoia trees. We walked more than an hour to see the Fallen Monarch, the Bachelor & Three Graces, the Grizzly Giant and the California Tunnel Tree. Then we headed south to Oakhurst for the night. 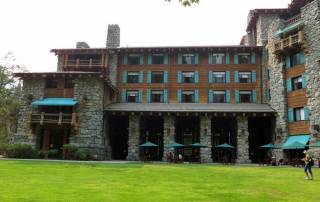 Along the way we stopped to check out Tenaya Lodge, which would be a much superior alternative to Wawona Lodge. The next morning found me checking the web cams for Yosemite at sunrise. The views indicated almost no smoke and we decided to invest 4 hours of travel time to return to Glacier Point again for another Yosemite Rim Fire visit. By 9am we had survived the twists and turns of the 5,000 foot ascent and were rewarded with a remarkable view at Washburn Point. It turns out we were barely in time. 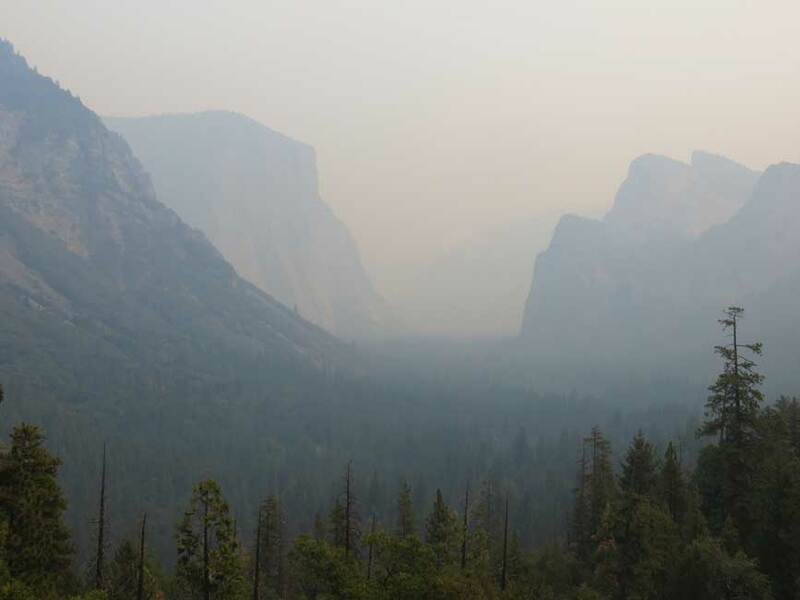 When we reached Glacier Point, about 5 minutes later, the smoke was visible over the valley. 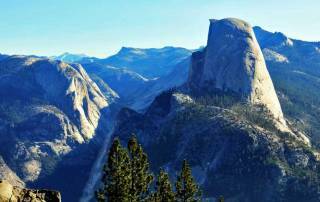 After another 5 minutes, the top of Half Dome began to disappear. We were very lucky to have arrived in time for the views. By noon we were back in Oakhurst again and then headed on about 3 more hours to Kings Canyon. The mountain roads there were the same as Yosemite. 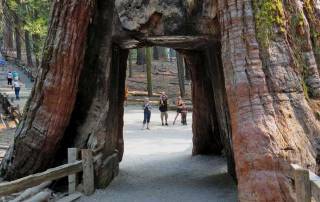 We visited the Grant Grove of sequoias at the higher elevations of the park. Then we descended along the cliff edges more than 3,000 feet to enjoy the Kings River at Cedar Grove. Along the way we stopped at Ten Mile Creek, which is several thousand feet above the Kings River. 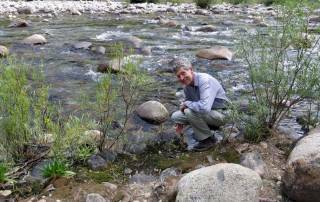 I had been here 50 years earlier watching trout in a small pool on the mountain side. I was amazed to find trout still surviving in this isolated spot. Just before the Kings River is a sharp turn undercutting the cliff edge that gets the adrenaline flowing. At the river you can visit Boyden Caverns, stay at Cedar Grove Lodge or camp at several locations. We thoroughly enjoyed dinner at the lodge. The Kings River is an isolated paradise, but we were happy to climb out of the valley in the morning and put and end to adventure driving in the high sierra.